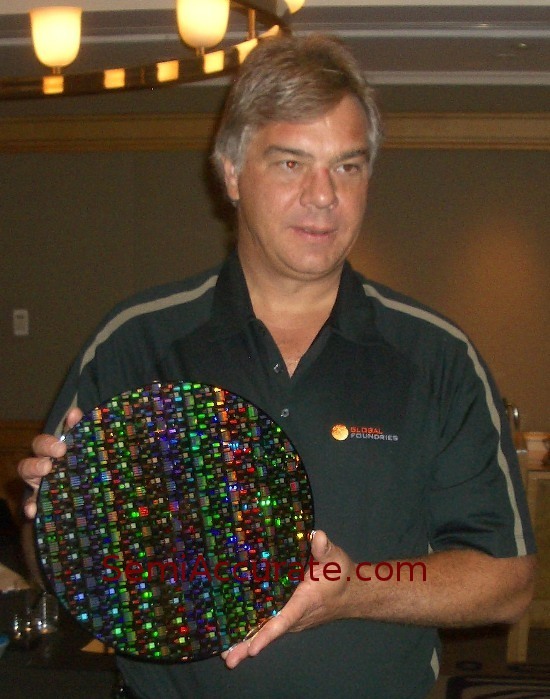 GLOBAL FOUNDRIES WAS showing off the goodies today, with three wafers of unreleased parts. Not only did they have the tried and true 45nm SOI process, but 32nm SOI and the long awaited 28nm bulk as well. 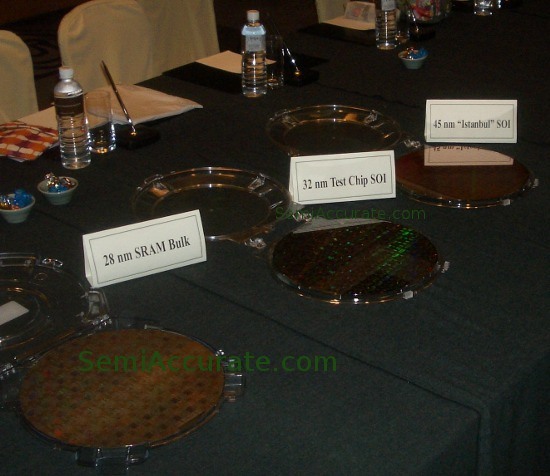 The first wafer they were showing off is a pretty known quantity, 45nm 6-core Istanbul CPUs from AMD. 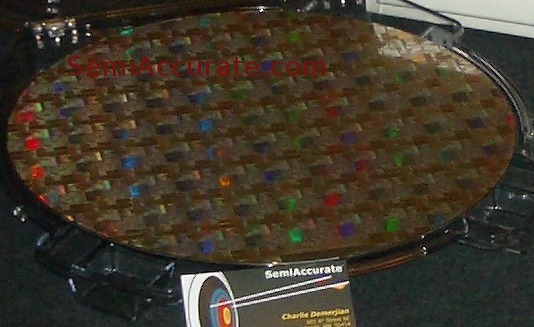 The chips are over 300mm^2 and roughly a billion transistors, and on sale now. Anyone who thinks Global Foundries (GF) is having problems with immersion should probably weigh this data point closely. The next one is a 32nm SOI test structure, logic and memory, rather than a functional CPU. This is the process that you will see the next gen Opterons and Phenoms on some time next year. The process is up and running in Fab 1, aka Dresden, now. It will have High-K and Metal gates (HKMG), and GF is expecting 40-50% scaling gains over 45nm. The big bang that Intel got from HKMG on 45 is what AMD and GF will produce on 32. It may be a day later, but it doesn’t look to be a dollar short. The last one is probably the most interesting. On the surface, it is only a half step shrink from 32nm, but 28nm has a few twists. The first is that it is a bulk process, so you won’t be seeing it on AMD CPUs, they need SOI. It is however compatible with GPUs, and other non-AMD designs. Keep an eye on this, it is where GF will likely grab huge chunks of business from TSMC and other foundries. GF is taking designs next year, and could squeak parts out late next year if all the stars align. In the end, Global Foundries has seven processes for now and the near future. They are split into High Power(HP), General Purpose(GP), and Low Power(LP). HP consists of 45 and 32nm SOI, GP has 32 and 28nm with HKMG, and LP has a 40/45 and different 32 and 28HPMG variants.